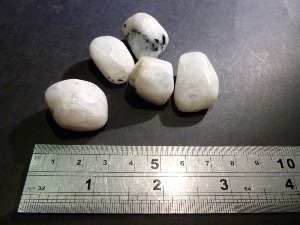 Moonstone is a feldspar mineral, a potassium aluminum silicate, Its crystal system is monoclinic and prismatic. Moonstone was named after its blue-white sheen, which is caused by its lamellar structure. It is found in Sri Lanka, Madagascar, Burma, Australia, India, and the United States. Moonstone was used in Roman jewellery almost two thousand years ago, and even longer ago in the Orient. It was a popular choice of jewellers during the Art Nouveau period. In India, Moonstone has always been a sacred stone, with special significance for lovers. It was believed that placing Moonstone in their mouths when the moon was full would allow them to see the future. 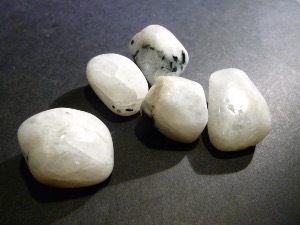 Moonstone is also a traditional wedding gift there, for bringing harmony to the marriage. In Europe, Moonstone was said to reconcile estranged lovers, and to cure sleeplessness. Rainbow Moonstone tumbled to a smooth finish, an ideal pocket size stone, small enough to carry around with you. Tumble Stones can also be placed around the home for their energies or can just be nice decorative items. Rainbow Moonstone crystal gemstones of varying sizes selected specially for your order.